The secret of fishing spoons? The "wobble"! What determines wobble? The shape and weight of the spoon. These, along with the "flash" of some styles, are what attract bass to strike spoons. Spoons are sight lures. Bass see them and mistake their erratic action as a baitfish in distress. Body shape of spoons determines whether they will have wide or tight wobble action. The longer and thinner the body the wider will be the wobble. Some spoons will have a concave (cupped) side, which of course means the opposite side is convex (bulging). The depth of the concave side impacts the amount of water it catches which in turn affects the amount of wobble action. Body size is also important. Be sure and select a spoon that is the approximate size of the baitfish the bass are preying on. Spoons are usually made of metal, lead, steel or brass. They will have a treble hook attached loosely to their rear or sometimes a single hook welded to its body. They will often have painted bodies but many are shiny silver or gold in color, which produces the desired "flash" so important when fishing for largemouth and smallmouth bass that prey on minnows as their primary food source. When fishing clear water spoon with flash is important. Retrieve speed is critical to correct presentation. 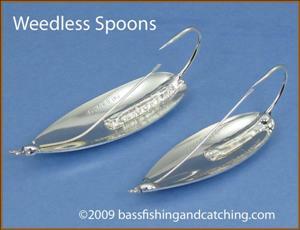 Too fast, the lure will spin or flip over, the latter being bad in the case of a weedless spoon. Too slow and you lose that all important wobble that makes a spoon so effective. There are several specific spoon types. Not all are, in my opinion, best suited for catching smallmouth or largemouth bass. Nevertheless, we'll briefly cover each and hopefully provide you enough information in subsequent pages so you can make your own decision about bass fishing with spoons. Broadly speaking this group will include any that are heavy enough to be cast effectively. Thin spoons are not good for casting as the thin body and light weight makes casting them like throwing an empty beef jerky wrapper into the wind. It's not going far. Casting spoons for bass are heavy enough that they can usually be cast a mile. They are also trolled and even jigged if fairly thick and heavy. Technically, jigging spoons are "jigging lures" and not really fishing spoons. Though they can be cast due to their weight, they're usually fished with a vertical jigging technique rather than cast and retrieved. The angler drops them into the water above located bait balls and bass and the lure tumbles down to the bottom like a drunken sailor stumbling down the street. As spoons go these are classically considered to be bass spoons. In warm weather periods, when shallow water grass and weeds are growing, weedless fishing spoons perform exceedingly well in drawing bass out of this cover. They have wire or bristle weed guards protecting single hooks which are rigidly affixed to the spoon's concave side. Traditionally thought of as spoon lures used for catching salmon, lake trout and walleye, they can be put to good use trolling for bass after they head to deeper water in winter. They are as a group, thin and light weight, weighing 1/8 ounce as a rule. An advantage when trolling but a nightmare to try and cast, so don't. These fishing spoons do not readily sink and require a "down rigger" or three way rig to get them down where the fish are. When and Where Do You Fish Spoons? Thought of as cold weather lures, when the water temperature falls to less than 60°, fishing spoons also have applications for summer bass in grass and other aquatic cover. The primary indicator for their use is when bass begin to school in fall feeding on balls of baitfish. Later they will move to their deep water winter haunts. Your depth finder is your best friend when searching for schooling bass. You can find them on points, in the mouths of secondary creeks, cuts and even in the very back of creek channels where there is some deep water next to shallow areas. When you do find baitfish don't waste time on even the largest group if not "tightly" bunched. The tighter the ball the more likely they are being fed on by bass. If loosely gathered they aren't worried about any prey fish close by so move past these baitfish. Baitfish are constantly on the move. Bass don't necessarily follow these masses of baitfish around the lake but rather find an ambush point from which to attack them as they pass by. Where might these places be? A great place to look is where a feeder creek merges with the main channel. Also look for break lines, points, humps, rock piles or brush and "laydowns" along the banks of secondary creek channels. Spoon Bites Are Usually Light - So Don't Hesitate Setting The Hook! Most bites, probably better than 95%, come on the drop of a spoon (excluding trolling spoons). The bites are usually light and quick. They won't hold a metal jig long. So, as you work your spoon, always be tuned in to the "feel" of the spoon your using. If you feel something different or coils suddenly appear in your line on the drop sooner than you know it could have hit bottom, set the hook! Let's take a closer look at the various styles of fishing spoons. 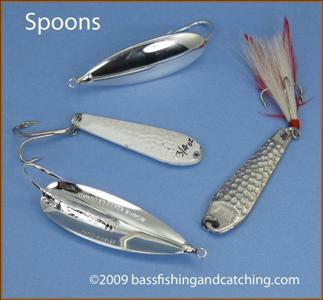 The emphasis will be on jigging spoons and weedless spoons as these are spoons most used by bass fishermen. Casting spoons and trolling spoons are used much less for smallmouth and largemouth bass, though I know some guys who troll Dale Hollow Lake and catch some really big smallmouth that way.